You must first understand the four stock market stages that individual stocks and the overall market go through. These cycles tell you if you should be long, short or in cash. Once you are able to identify what stage it is in, you can then trade accordingly to those characteristics. After a while you won't even have to think about whether you should be long or short. You will know, without question, exactly what you should be doing now. You will either be focusing on long positions, short positions, or you will stay safely in cash - just by glancing at a chart! 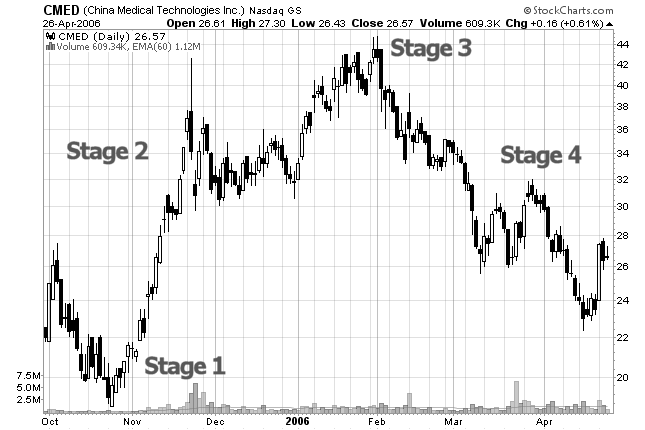 Here are the four stages that stocks go through. This happens in all time frames whether it is a monthly chart, weekly chart, daily chart, or an intraday chart. Ok, so I'm not the best artist in the world but I think it will serve our purpose here! You thought it would be more complicated that? My philosophy on the stock market is that if it is too complicated then it is just not worth doing. 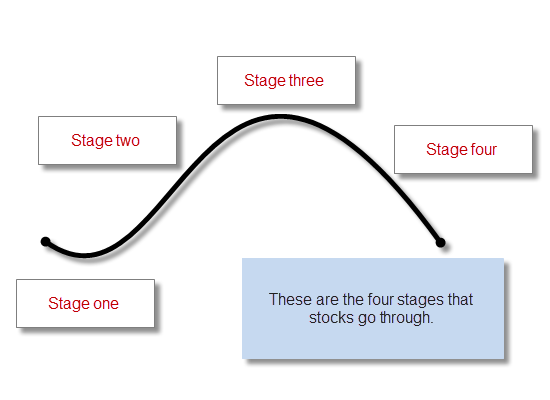 Now, we'll look at the characteristics of the four stock market stages. I promise it will be painless! Finally stocks break out into Stage 2 and begins the uptrend. Oh, the glory of stage 2!! Sometimes I have dreams of stocks in Stage 2! This is where the majority of the money is made in the stock market. But here is the funny thing: No one believes the rally! That's right, everyone still hates the stock. The fundamentals are bad, the outlook is negative, etc. But professional traders know better. They are accumulating shares and getting ready to dump it off to those getting in late. This sets up stage 3. Finally, after the glorious advance of stage 2, the stock begins to trade sideways again and starts to "churn". Novice traders are just now getting in! This stage is very similar to stage 1. Buyers and sellers move into equilibrium again and the stock just drifts along. It is now ready to begin the next stage. This is the dreaded downtrend for those that are long this stock. But, you know what the funny thing is? You guessed it. Nobody believes the downtrend! The fundamentals are probably still very good and everyone still loves this stock. They think the downtrend is just a "correction". Wrong! They hold and hold and hold, hoping it will reverse back up again. They probably bought at the end of Stage 2 or during Stage 3. Sorry, you lose. Checkmate! Stock market stages occur in all time frames on every chart you look at. This could be a five minute chart of Microsoft or a weekly chart of the Dow. Generally, you want to stay in cash when a stock (or the market itself) is chopping around in a stage one. In stage two you will want to be aggressively focusing on long positions. In stage three you want to be in cash. In stage four you want to be aggressively focusing on short positions. But, here is where it get a little tricky: Within each stage there are waves. You can learn more about these waves on the Elliott Wave page. That's all there is to it. I told you that trading with stock market stages would be painless!